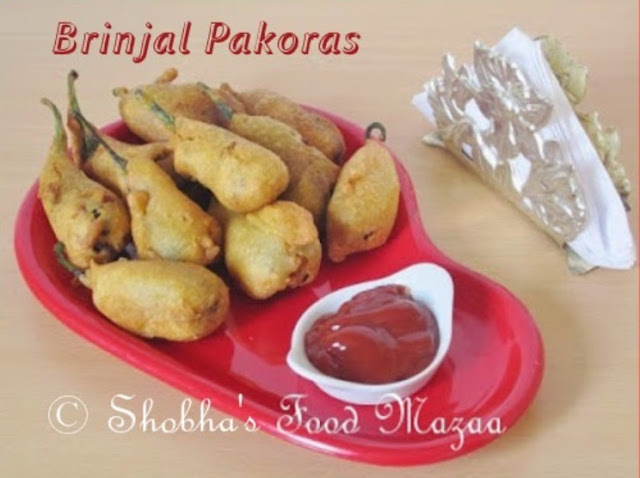 Try out these yummy baby brinjal pakoras with chatpata stuffing. You will love them so much that you can't stop with one or two. Mint Chutney .... For stuffing. 1. Slit the baby brinjals and leave them in salt water for 1 hour. 2. Drain the water and pat them dry with a kitchen towel. 3. Stuff them with mint chutney. Make the chutney very spicy. 4. Grill the stuffed brinjals for 5-7 minutes. You can also do it in the microwave or in a pan / griddle leaving them on low flame taking care not to over-cook them. Let them cool before frying. The grilling/cooking time depends on the size of the brinjals. 5. Mix the besan with water adding salt and baking soda to a thick batter. 6. 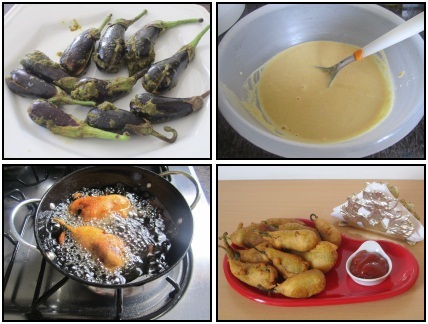 Coat the brinjals with besan and deep fry them. Serve them hot with any sauce. Must try these .. a sure hit ! Yummy pakoras..Loved the idea of stuffing them.. The stuffing gives a delicious and chatpata flavour. amazing very perfect for this winter season. I like this stuffed verson. Yes Jaleela.. with a cup of Masala chai .. it is Bliss ! Never tried pakoras with whole baby potatoes,sounds awesome. Wangur jaa Pakora are just "Mast Aahyan "
Roma, it is a pleasant surprise to see your comment in my blog.. do keep visiting ! Please help yourself with the yummy snack. New to me,looks great,love the stuffing inside. Like your FR page..pls like mine too. pakoda with brinjal is new to me.will try it.